! Atherton Tablelands Country Markets ! Tropical North Queensland, Australia. Yungaburra Markets, 4th Sat. each month. 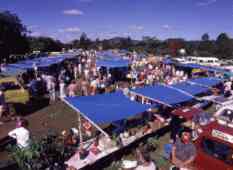 The Waterfalls and Crater Lakes District of the Atherton Tableland is renowned for its Country Markets that are held every weekend. The markets alternate between towns each weekend so all the people of the Atherton Tableland get to appreciate this weekly spectacle. Towns that the markets visit include Atherton, Tolga, Mareeba, Archer Creek, Malanda, Wondecla, Yungaburra, Ravenshoe and Kairi. While Kuranda holds a market every Sunday, Wednesday, Thursday and Friday. Day Held: Second Sunday of every month. Location: Centre of Archer Creek, 25km West of Ravenshoe. Day Held: First Saturday of every month, morning only. Location: Atherton, Platypus Park, along road to Herberton, next to historic railway station. Day Held: Fourth Sunday of every month. Day Held: Every Sunday, Wednesday, Thursday and Friday of the week. Day Held: Third Saturday of every month, morning hours only. Location: Jack May Park, opposite the showground in Malanda. Day Held: Second Saturday of every month. Location: Ravenshoe School, Central Ravenshoe. Day Held: First Sunday of every month, morning hours only. Location: Tolga, Marrow Park, next to race course, behind peanut processing plant. Day Held: Third Sunday of every month. Location: Centre of Wondecla. 10km out of Herberton on the Ravenshoe Highway. Day Held: Fourth Saturday of every month, morning hours only. Location: Centre of town in Yungaburra.